Academic Model Providing Access to Healthcare (AMPATH) is a partnership between Moi University School of Medicine, Moi Teaching and Referral Hospital (Kenya's second national referral hospital), and a consortium of U.S. medical schools led by Indiana University, AMPATH promotes and fosters a comprehensive approach to HIV/AIDS control that complements and enhances the existing health infrastructure. AMPATH addresses food and income security needs, delivers and monitors ARV treatment, and fosters prevention of HIV transmission through community-based health education and prevention of maternal to child transmission. Importantly, AMPATH works with all levels of health providers from the highest levels of government to community health workers (CHWs) to provide effective and culturally appropriate care. The Purdue University College of Pharmacy is a member of this consortium of schools and provides clinical pharmacy services for the >70,000 patients receiving care within this system. Innovate, provide, and enhance quality care for all people through teamwork and dedication. 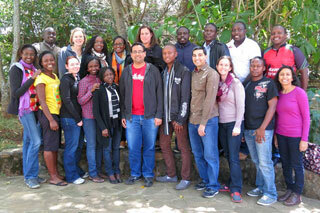 To help AMPATH and the Purdue Kenya Program, please visit our Donation Page and follow the instructions on the page.